Receive Thai Amulet Blessing for Health, Wealth, Career, Business, Relationship & Good Fortune. 100% genuine authentic amulets consecrated by Thai Buddhist guru monks. Time to change your destiny for better future! *NEW* - Join our new membership referral system to allow you to purchase our products at a discount plus accessing to some stuff for free. 20% discounts for all products when you subscribe as our members today! Amulets and Buddha Images is extensive and valued in excess of 500,000 Baht. Some are very old, antiques, others specially reproduced as souvenirs for our visitors to take home as a reminder of their visit. Amulets exemplify the power of faith. They are objects that inspire believers to invest their strength and dedication to succeed in their pursuits. Amulets have a spiritual value beyond the commercial and only monks who have attained purity through rigorous practices can channel their power to the creation of amulets. The reputation of these monks will determine the value of their creation. I have been asked by Cougar to write up a page on this so I guess that it'll do nicely as I believe other pages have not done this yet, or at least not so detailed. I hope readers can contribute their stories here but please don't make them up. :) I'd really appreciate good stories about amulets so that we all can share these little knowledge that we have. 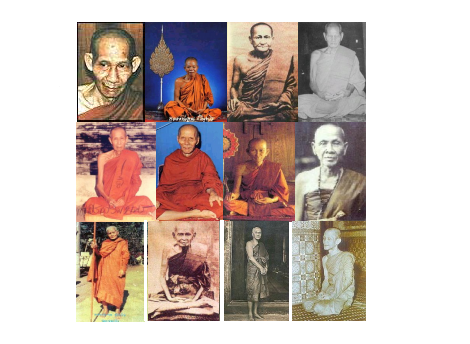 To begin, let me start on a story that has been told personally by my friend, Mr Tommy Wee, about a Luang Phor Thuat amulet and by far, stories on Luang Phor Thuat amulets are the most that I've heard of! I was studying for my 'A' Levels in Perth, Western Australia when I was 17. At that time, I already had my driving license and I have a very bad habit of speeding. I never knew that it would bring me trouble but neither did I know that the little amulet placed in my car by my mother would have saved my life too. I was travelling along the freeway one afternoon to send my friend of at the airport. Before I left, my dad told me to change the tires as they were almost bald. I didn't change the tires and on top of that, I was travelling at the speed of around 100km/h. So I was racing along the freeway and I entered into a no-entry zone which is a bus lane on the extreme right. I pulled the steering wheel hard to the left and before I knew it, the car went skidding and it went turning upside down all over the place! I realized that it landed on its wheels and carried on moving until it crashed into a railing which blocks vehicles from entering the river. The whole car was smashed up yet I did not even have a single scratch on me! A police cruiser came by a while later and I was still holding onto the steering wheel, not knowing what hit me.